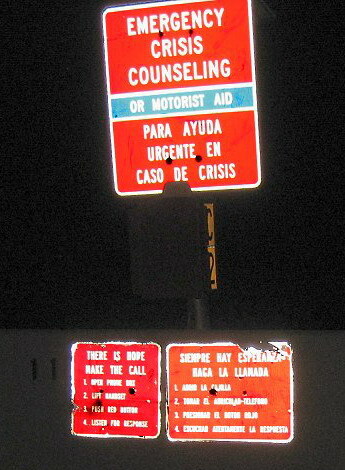 google 'street view' and the crisis hotline phones. 7.17.99: article about the solar powered crisis hotline phones. 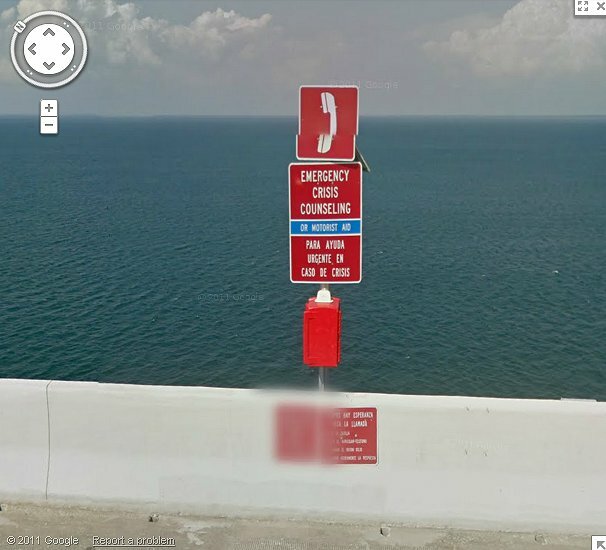 google.com/skyway bridge 'street view': click and drag the little orange guy. a pulsing circle appears under him and viewable item icons appear. place that circle over any of the highlighted areas until the circle turns into a green 'hershey's kiss' and a small preview window pops up. 'drop' the little guy there or on the bridge. explore using the upper left controls in the 'street view' window and your mouse. there are images of the bridge from many angles. we take no responsibility for the hours of time you may blow playing with 'street view'. travel the country, visit the family, spy on your ex. 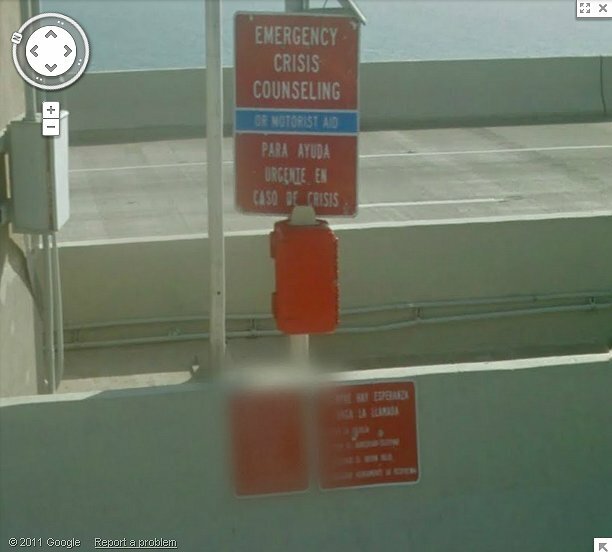 unclearly, 'google street view' finds issue with something about these signs. what could it be? in english, may be harmful to it's users. 04.03.12, Blair, It was a very quiet Tuesday night (or Wednesday morning) on Hwy 275 after leaving the fishing pier... and you know I just had to do it... I stopped on the Skyway and took pictures. Awesome being the only one at the top of the massive bridge! Since no cars passed by, nobody to report to your site about the silver midsize sedan stopped at the top as a possible jumper, unless someone viewing the bridge security cameras would tip you off. My apologies the flash isn't so great on my camera, and actually kind of creates a haze where it should be darkness... 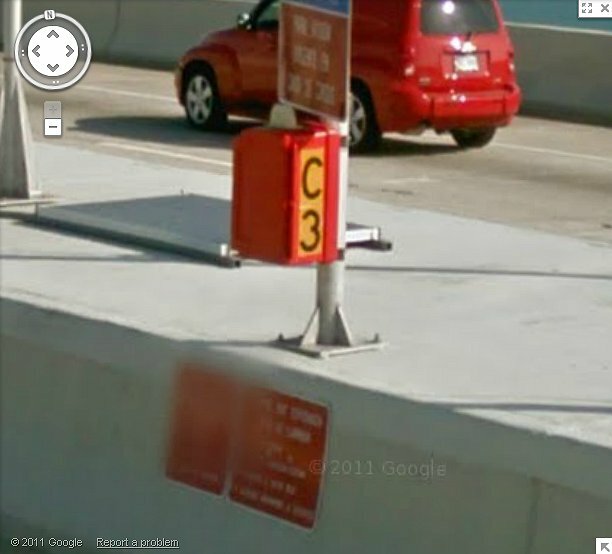 Anyway, the point of this was to get clear (readable) photos of one of the callbox signs which Google's street view deliberately censors by blurring: all six, even if viewed across the median on the opposite side of the bridge. Google is thorough. This was achieved with success! But now I am disgusted with Google. Imagine being so deliberate to censor: "THERE IS HOPE - MAKE THE CALL". How sad / sick is that? Exactly the "look the other way", "pretend it doesn't happen", "STFU about it" attitude you and others (even recently from Australia) mention time and time again. And obviously Google is making their position clear, there is No hope. The instructions 1-4 on how to operate the telephone would be of no concern, so it has to be the main message which is being obscured.